In the heart of Birmingham’s Theater District, the Jefferson Home Furniture property is for sale (previously Joiner and Cain Furniture). Above is a photo from the 1940’s showing the larger concrete frame building in the center on Second Avenue North between 17th and 18th Streets; the smaller wood frame building to the far right is also included. Directly to the west is the Phoenix Building, a popular 74-loft development (the old Jefferson Theatre in the photo was demolished soon after this picture was taken and replaced with the expanded Phoenix Building). Within a half block are the Pizitz and Thomas Jefferson Tower mixed-use projects currently under construction. A Zyp bike station is directly across Second Avenue; Railroad Park and the booming Parkside District are 3 blocks south. The Alabama, Lyric, and Carver Theatres are all within a couple minutes’ walk. Both Federal and State historic tax credits have been substantially approved for converting this property. Please contact Southpace Properties here for more info on this opportunity! Al.com is reporting today that VIVA Health, an HMO, is expanding its downtown headquarters at 20th Street North and 5th Avenue, resulting in up to 400 new jobs being added to the City Center. While the bricks-and-mortar impact won’t be immediately visible from the street—the expansion involves renovating existing empty floors within the building—downtown should feel the impact in a couple significant ways. One, more foot traffic and demand for retail services; two, a reduction in the overall vacancy rate of the Downtown Submarket which currently stands at 11.9%, slightly better than the metro average (current VIVA lobby, above). Coincidentally, the news comes on the heels of another local healthcare corporation’s announcement about its own headquarters: HealthSouth, currently located on Highway 280 and Grandview Parkway (within the City limits of Birmingham but 9 miles’ distance from downtown) will build a new headquarters building in Liberty Park (again within Birmingham City limits, and about 15 miles’ distance from downtown). Unremarkable, except for the fact that HealthSouth had seriously considered moving to Parkside, the burgeoning downtown neighborhood, and constructing a signature headquarters building there instead. 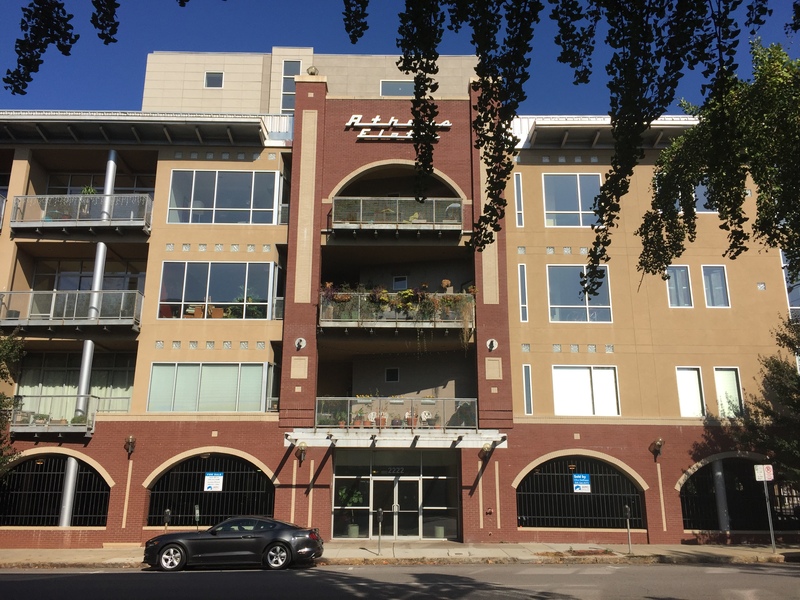 In a recent article in Al.com, CEO Jay Grinney defended the decision to stay in a distant location rather than join the increasing numbers calling the City Center home. The main factor, he claimed, was a company-wide poll of employees who were posed the question: Would you rather work downtown or Liberty Park? This poll came back with a solid majority in favor of staying south of the City, and he couldn’t bear the thought of all those unhappy workers stuck in traffic headed into downtown daily. Birmingham is not known for corporate leadership that looks beyond parochial concerns to support the greater community in an impactful way. Parisian CEO Donald Hess arguably came close by stepping up to chair the failed MAPS campaign of the late 1990’s (incidentally also supported by the former HealthSouth CEO Richard Scrushy). But we’ve had no equivalent to Quicken Loans CEO Dan Gilbert who moved 1,700 employees into a new downtown Detroit headquarters in 2010 after 20 years in the Detroit suburbs. This move is widely credited as crucial both literally and psychologically to that city’s current comeback; Quicken now has 12,000 employees in and around downtown and has decided to house them in formerly vacant buildings rather than build a glossy new tower (renovated Qube building above). Rebounding cities need lots of ingredients—from grassroots individuals to corporate CEO’s—to create a truly vibrant and diversified environment. One can only imagine if Gilbert had taken a “Would you like to move to downtown Detroit” poll of his employees back in 2005 what the response would’ve been—surely even more negative than the HealthSouth poll–but ultimately the workers now enjoy all sorts of urban amenities and conveniences they couldn’t have envisioned 10 years ago, and the downtown Quicken campus is consistently rated by employees one of the best places to work in the Detroit metro. In the end, however, this week’s news is positive: VIVA is expanding, and HealthSouth, a company with 23,000 employees nationwide valued at $2.3 billion, remains headquartered in the City. What Birmingham truly needs is an influx of new people moving here from outside the metro, attracting new ideas to the area and expanding the economy (above, young employees take a break at Quicken downtown). For too long we’ve been playing a shell game between City and suburbs; instead we’d rather see a growing City, healthy suburbs, and all local municipalities banding together to attract new jobs to the area. As exciting as a new HealthSouth HQ may have been on the Midtown skyline, it would be a much, much bigger story if we could attract a Fortune 500 company from outside the state to do the same. The new Parkside neighborhood taking shape around Railroad Park is promoted as a mixed-use urban neighborhood with plenty of retail, restaurant, and entertainment. It seems basic, but new projects must provide rentable ground floor space to sign up the retail, restaurant and entertainment that attract people to live, visit and stroll the streets. How are some current projects stacking up in this regard? 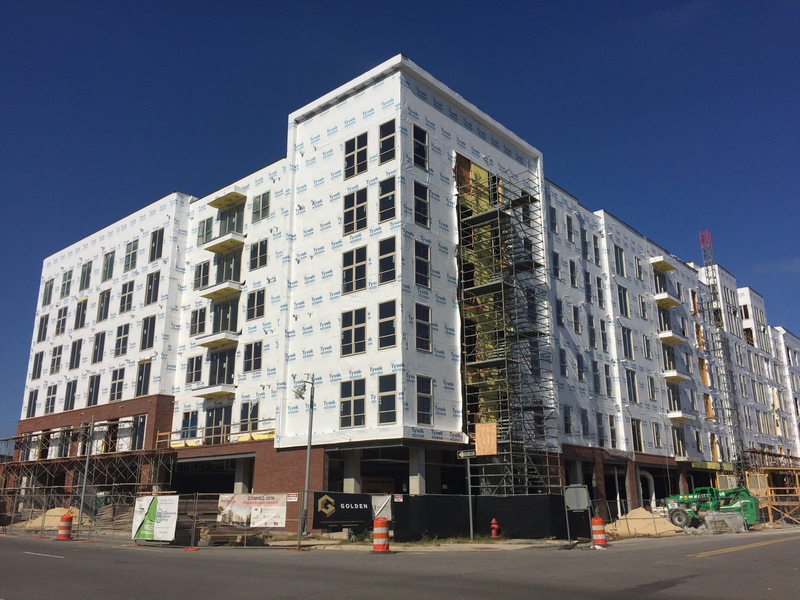 Currently under construction, 20 Midtown is one of the most prominent, retail-wise, in the area (multi-sites along 20th Street South between Second and Fourth Avenues; architect: Cohen Carnaggio Reynolds). The first building’s Starbucks has recently opened (above); a Chipotle is on its way, and a Publix supermarket is coming in 2016. This lineup of national retailers is fairly unprecedented for a single project downtown or midtown. The supermarket alone promises to be a major anchor that will pull other developments into the area. The next phase of the project (above) has even more retail space along both frontages. According to the retail leasing site, about 110,000 SF of retail and commercial space will be provided in the completed project (ground floor retail appears to be approximately 85,000 SF). From a pedestrian-friendly planning perspective, the “urban drive-thrus” servicing Starbucks and other businesses aren’t ideal, and the curb cuts required between these and the other inner parking decks feel excessive–but at least the overall mass of the buildings are dominant, and these cuts are relatively minor breaks to the retail street frontage. 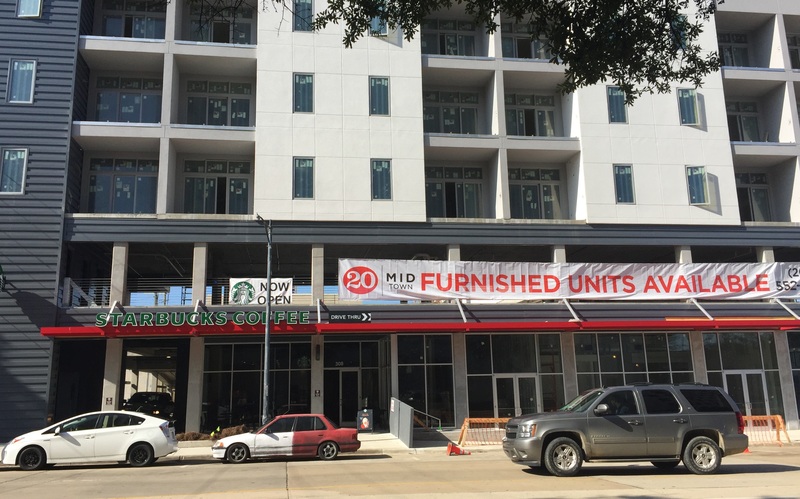 In sum, 20 Midtown does an excellent job providing storefront space to the neighborhood. 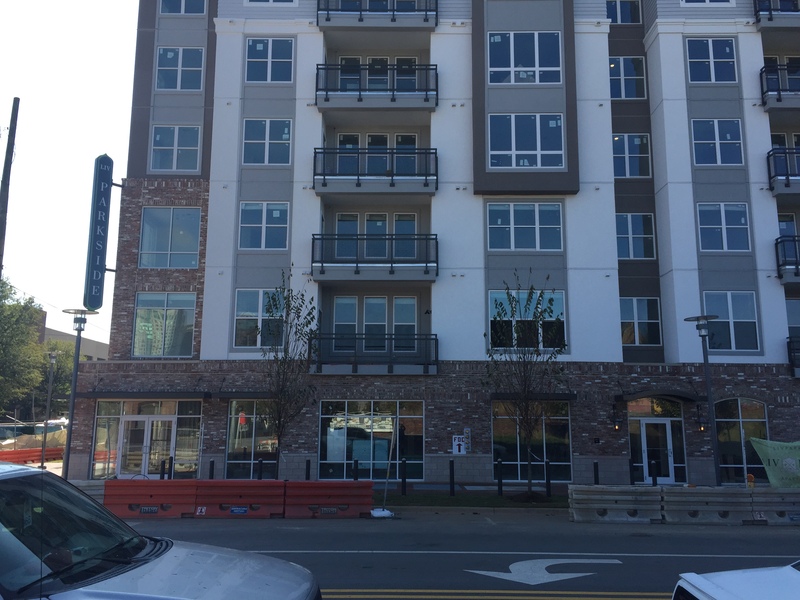 The Liv Parkside mixed-use development (above, main elevation on First Avenue South between 18th and 17th Streets; architect: Charlan Brock & Associates) fills an entire half-block in a very prominent location directly across from Railroad Park. 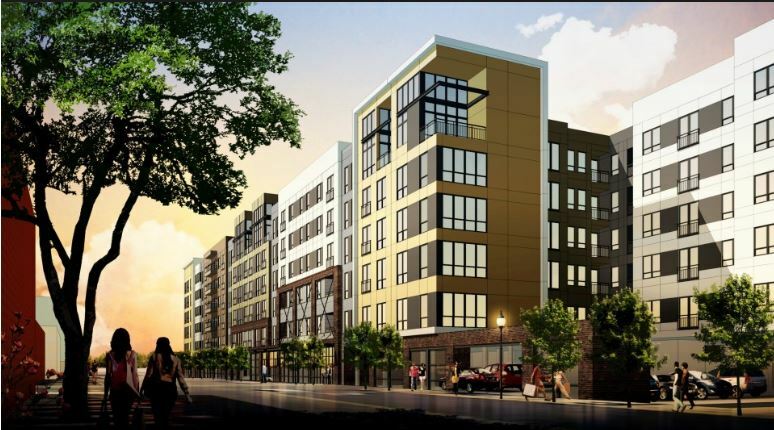 Due to its size (it will contain 228 rental apartments) and its location, it’s disappointing that it will offer only 4,000 SF of retail. And it’s not just the paucity of retail that’s a concern–the treatment of the storefront is architecturally weak, an odd combination of brick and punched openings that feels out of proportion with the major civic space it faces. In comparison, 20 Midtown’s more straight-forward storefront feels sophisticated and well-scaled to the streets. Overall Liv Parkside is a missed opportunity for invigorating the sidewalks fronting the park. On the bright side, local coffee house Red Cat will anchor the retail mix and plans a Sunday brunch that will no doubt prove popular for residents and visitors alike. Just southwest of Liv Parkside is the Venue, providing 236 rental apartments (above, looking at the corner of Third Avenue South and 16th Street; architect: BOKA Powell). In a blow to potential adjacent street life, this development offers no retail storefronts whatsoever, with the lobby and leasing office providing the only ground floor activity. If Liv Parkside offers too little rentable storefront, the fact that Venue offers none is truly a letdown. As a consolation, the developers do state that, while no retail is being offered, there is ground floor space behind roll-up glass doors suitable for food trucks; perhaps this same space can be finished out for retail in the future. In the rendering above (along 16th Street) it’s possible to see these openings in the middle-to-far distance. For a mid-rise, dense urban project, the architectural massing and materials are better than some, but the street level leaves, unfortunately, much to be desired. 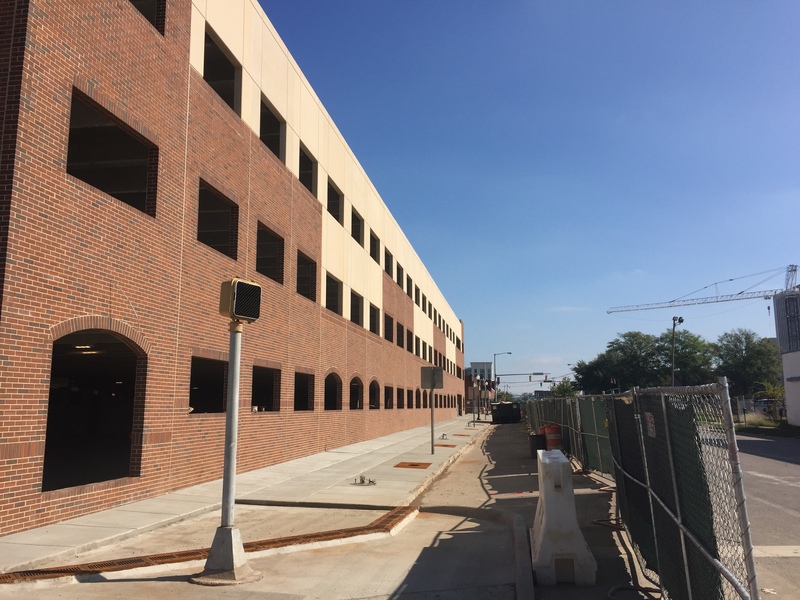 Along 18th Street South and Second Avenue, Healthcare Realty Trust, the REIT which owns a building directly north, is constructing a parking deck on a former surface parking lot (above, looking east along Second Avenue). There is not much to say here, except that there’s no attempt at an architectural fig leaf: we get a stark, block-long wall of brick, with smallish pierced openings looking directly into the garage. That this is being built a half block from Railroad Park is pretty devastating. 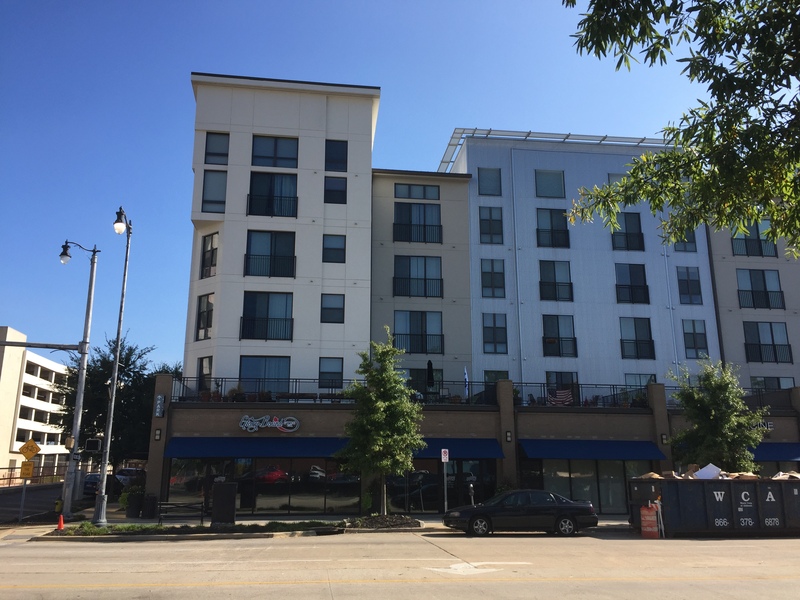 Zoning laws in the City should be amended to require any parking deck constructed in prominent urban places to contain ground floor retail or other components to enhance the adjacent public space of the street, rather than cheapen it. Headed back over to 20th Street, the good news is the large Station 121 building (completed 2010, seen above looking east at the corner of 20th Street South and First Avenue; architect: Niles Bolton and Associates) is rapidly filling its storefronts. Having been mainly vacant due to the recession generally as well as market hesitation at this location specifically, the 21,000 SF of retail is now succeeding due to its proximity to newer developments including the Publix supermarket, and the general growth of Midtown which 5 years ago was still hypothetical. This block of retail and restaurant should nicely complement 20 Midtown’s efforts directly south. Which brings us to our final, cautionary image: Athens Flatts, seen above along Second Avenue North between 23rd and 22nd Streets (completed 2007; architect: Rob Walker Architects). The ground floor is a cousin to the new parking garage mentioned above–arched openings with metal security barriers look into a bleak parking garage which, especially at night, is completely at odds with the pedestrian character of this part of Second Avenue which is filled with bars and restaurants. Perhaps one day a portion of this garage will be carved away allowing these arches to open into shops and cafes. Until then, it serves to show us what happens when developments neglect the life on the streets that every urban structure has an obligation to engage. Let’s ensure future Parkside developments don’t fall into the same category. 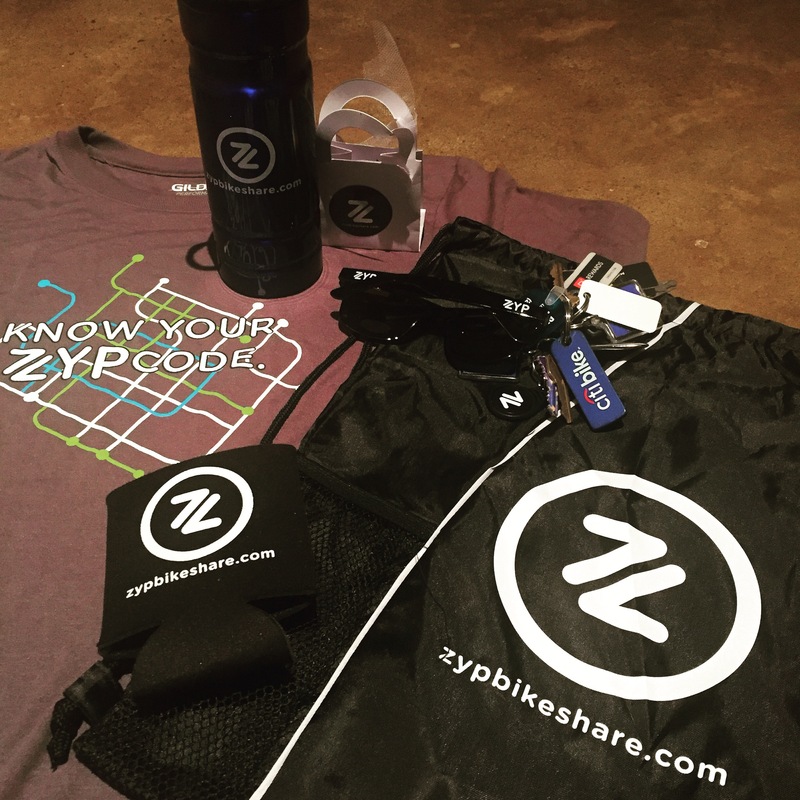 It was so exciting to receive Birmingham’s new bikeshare key fob and assorted swag in the mail tonight, we just had to post a pic. 400 bikes rolling into town imminently–and a step forward in providing more transportation options to the community. If you haven’t joined up yet, check out www.zypbikeshare.com. And kudos to the designer–terrific logo. The fob already looks great next to the CitiBike fob already on the keychain. Official rollout is October 14 so get ready BHM! Congratulations to the Highland Park neighborhood, just south of downtown Birmingham, which has won the 2011 American Planning Association’s Great Places award, one of 10 neighborhoods nationally to win the honor (see this morning’s Birmingham News piece ). Highland Park, one of the city’s oldest planned neighborhoods, is also the densest populated neighborhood in the state of Alabama. It’s known for its diversity of income levels, architecture, and topography. 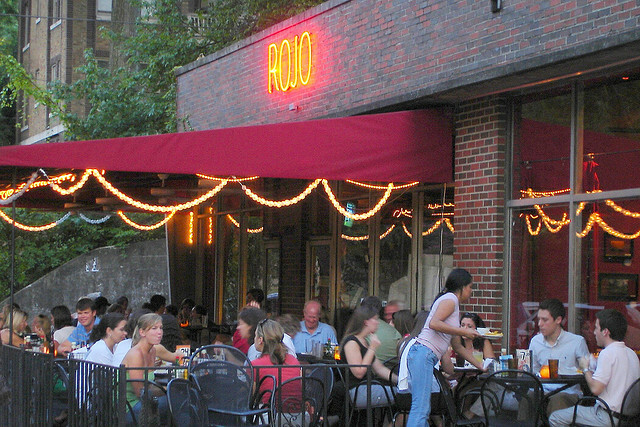 It is also known for its pedestrian/transit/bike friendly streets, accessible parks, and independent businesses (such as Rojo restaurant, pictured above). Other neighborhoods recognized this year are: Northbrae, Berkeley, CA; Ansley Park, Atlanta, GA; The Pullman Neighborhood, Chicago, IL; Gold Coast & Hamburg Historic District, Davenport, IA; Hattiesburg Historic Neighborhood, Hattiesburg, MS; Dundee-Memorial Park, Omaha, NE; German Village, Columbus, OH; Swan Lake, Tulsa, OK; and College Hill, Providence, RI. Positive national recognition is what this City needs more of. Keep it coming!! 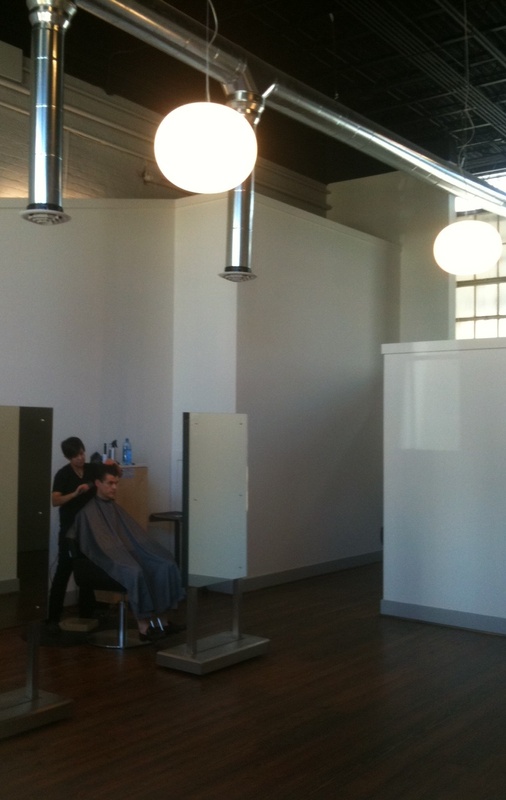 Every downtown core deserves an upscale, well-designed salon. We finally have one in the form of Click, which recently opened at Pepper Place (2829 Second Avenue South). The converted warehouse space is open, airy, and minimalist. Products are tastefully to the side of the lobby; hair is cut by black-clad stylists facing freestanding mirrors, rather than walls; clutter and noise are minimal; the color palette and lighting are simple and soothing. The best thing about this place for your author: it’s a 4 minute bike ride from home. Speaking of bike rides, the Green Building Focus conference and expo will be held Thursday and Friday at Cahaba Grand Conference Center. The expo is free so anyone who is interested in green building and improving our environment, plan a visit.